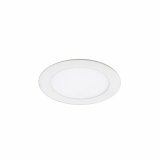 LOTOS - 4" Adjustable LED Recessed | WAC Lighting Co. Shallow profile LED that is designed to fit in furred down ceilings without sacrificing lumen output. Available in 4" or 6" recessed or 4" adjustable LED recessed. Ceiling thickness: 1/2" - 1 1/2"